When first I read LCN I was struck by the lack of detail which accompanied the “Starea” or coastal sailing data. Detailed examination of the “Starea” section led me to assess it as not fit for purpose; errors abounded and the individual coastal sections described there-in were, in places, diametrically opposed to the geographical fact. At that point in my research I placed LCN to one side for future research as I had determined the errors would require a long and painful project to assess the actuality of the text. I also considered that most of the “Starea” distance/directions could not actually be drawn on the majority of extant Portolan charts as the chart scale being so small precluded any accuracy of measurement or direction in the individual section to be drawn. Whilst it was all on hold, J T Lanman wrote “On the origin of Portolan Charts” wherein he concluded that a Portolan Chart could be drawn from the “Starea” data. He also concluded that from the Peleio distance/direction data given, his observations determined that they were from the use of an unadjusted magnetic compass. But his research did not utilize the Peleio details. My text ChLCN/1 fully details my objections to that research and its conclusions, and should be read with text ChCaP/1. There-in you will read my conclusions overturning the previous ideas of many researchers. That would not have been possible had I not chosen a draughtsmanship method to evaluate the LCN text. It has taken years of slow research to arrive at this point and thus write the preceding texts, based on this research. In the meanwhile I have indicated the problems and pointed to those obvious errors in my many previous texts which appear to have been ignored. 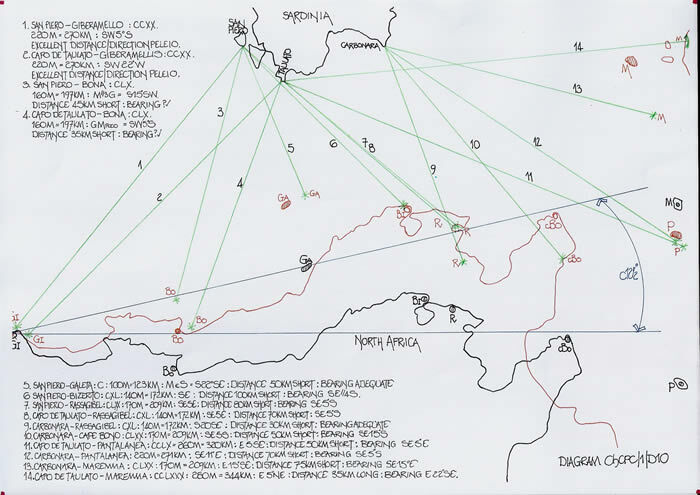 Thus here-in is analysed the Peleio section of LCN which indicates the simplicity with which the data can build the coastal feature locations for the whole Mediterranean Sea basin, and allow a complete Portolan Chart to be drawn, which has only a natural projection. However it should be noted that it is not possible to randomly choose Peleio distance/directions, unless you use them all. A major analysis of those within the original text would be necessary. This is a slow and laborious task, fitted only for persons with time available. I have already opined that I do not consider draughtsmen c1300CE likely to have had that amount of time to spare. Time was then money, and thus I consider the original map and Peleio data used arises from a body of researchers, probably monastic scribes, for whom time and money were not the main issue, the end resultant was, as then it could be copied, sold or exchanged. But I consider it was an amalgam of text and map. Within this text I convert all Millara measures to Kilometres with the ratio of 1 Millara equals 1.23 Kilometres. However, I consider it necessary to validate that choice with an explanation of its origin. The Roman world was based upon 75RM per degree of latitude with an RM equal to 1000 mpm being 5000p, 8 stadia of 625p, which is 1.47911Km. The individual Pes is 11.64706 statute inches, nominally given as 11.65 statute inches. Reduce the Roman mile, MPM, to its basic components, they are, 16 digitus per Pes and 12 uncia per Pes which gives, 5000 x 12 = 60000 uncia. But, 50000 uncia or 5/6ths of an MPM equalling 1.47911Km is 1.232653Km. Thus the Millara is actually 6.667 stadia or 50000 pedes, and notionally written as 1.23Km. The definitive proof of this hypothesis comes from a study of a 14th century Portolan Chart indicated within the following text ChMAT/1. However, be mindful that medieval mathematics, as shown by “Tavola de Marteloio” indicates that 71 was considered the notional ratio for a 45 degree triangle (not 70.71) and 50000 pedes is the simple multiplication of a 70.71 or 71 square (70.71 x 70.71 = 5000). Having studied the LCN text and noted many variants within the directional notation, as I have already opined to be of any use relied heavily on the mariner viewing the coastline he was sailing. Thus I decided to commence the research using the simplest of data, that of Peleio distances given as one of the eight major wind directions, N/NE/E/SE/S/SW/W/NW and thus I had obviated the necessity at the commencement of the research to assess what “Greco e Levante” or “Greco ver lo Levante” actually meant to the original author or compiler. There are c80 such Peleio within LCN and by studying them it became obvious that the basic information for a chart was included. However I decided reluctantly that I would enlarge the research to cover all +300 Peleio routes as I was uncertain of the master routes and considered it necessary to ensure an overall picture of their accuracy and where any fault lines occurred. I obviously considered the possibility of many master alignments, E/W and N/S, but they were not visible as one. Firstly it is obvious from the use of ‘skins’ that unless they were joined to form a large base, then the natural sheepskin or goatskin will determine the size of the chart, length and breadth. 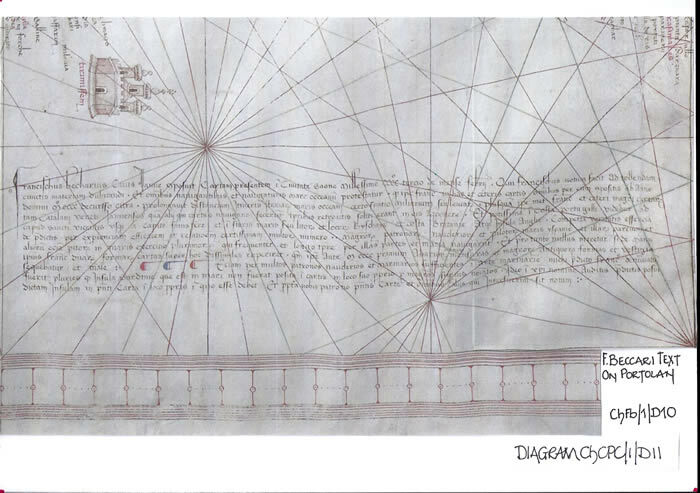 But the first “Map within a Portolan Chart” drawn from these Peleio distances ( if in fact it was?) 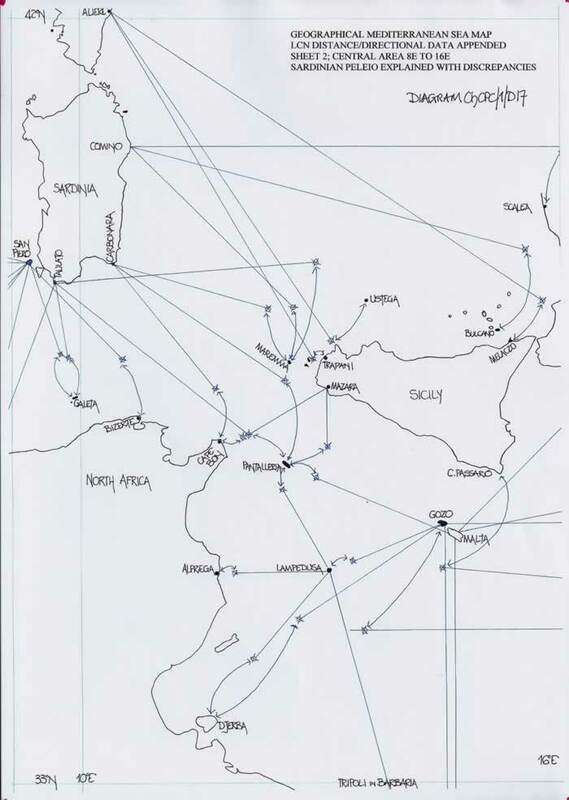 would have necessitated the knowledge of the Mediterranean Sea basin from 9W, Cape St Vincent to 36E, the Levant shoreline and then 42E to cover the Black Sea area. The breadth, North/South, would be determined from the Gulf of Sirte to N Italy and then the Sea of Azov, basically 30N to 45N and then 48N. 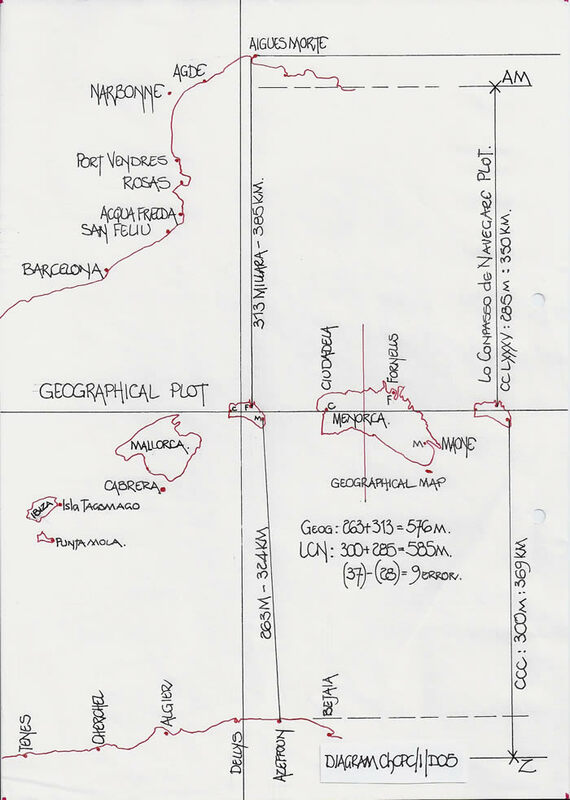 Thus the important Peleio distances are those given as Levante/Ponente for east/west, or Tramontana/Meczo for north/south. 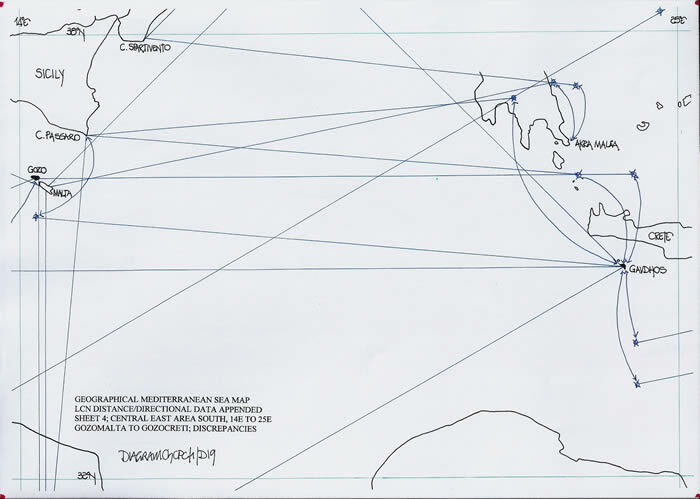 But of course there are no direct alignments which can be added together to form the overall Mediterranean Sea basin and thus a simple geometric methodology was required to find the overall size of the finished chart. Read LCN and one of the immediate facts apparent is that many coastal features are detailed from several points thus providing for a methodology to pinpoint those coastal features. The answer is a triangle. To lock a number of points into a precise position the triangle is perhaps the simplest methodology. To actually draw a triangle a line of known length and two angles or winds are all that is required. Thus distance and direction determine coastal positions and can be evaluated by using the alternate references. Hence I return to the statement made in my previous text regarding the possible first line to be drawn from which the triangles are then constructed outward to form the chart. I considered that line to be the north/south alignment through Genoa/Corsica/Sardinia to N. Africa, basically the 9E longitude. My previous texts fully explain this decision. 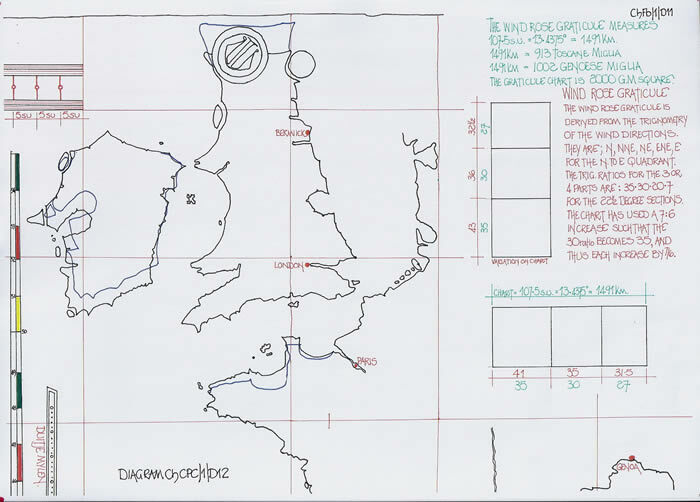 To draw a map which purports to be geographical, accurate for usage, it must be constructed. That requires first establishing E/W and N/S master alignments to control what follows. Each and every Windrose on a Portolan chart is oriented N/S/E/W; there is no deviation for perceived magnetic affect in the Windrose construct. Thus when you read LCN it is very apparent that a very large number of the wind directions when plotted on a geographical map are correct. These are spread throughout the text (with others obviously in error) such that it is only correct to conclude there is no magnetic deviation within the LCN text. Yes, there are errors which in most cases are so very apparent, but, it means we can evaluate each Peleio, set it on a geographical map and confirm its accuracy both for distance and direction. But note well I have not rewritten the LCN text to obviate the errors. 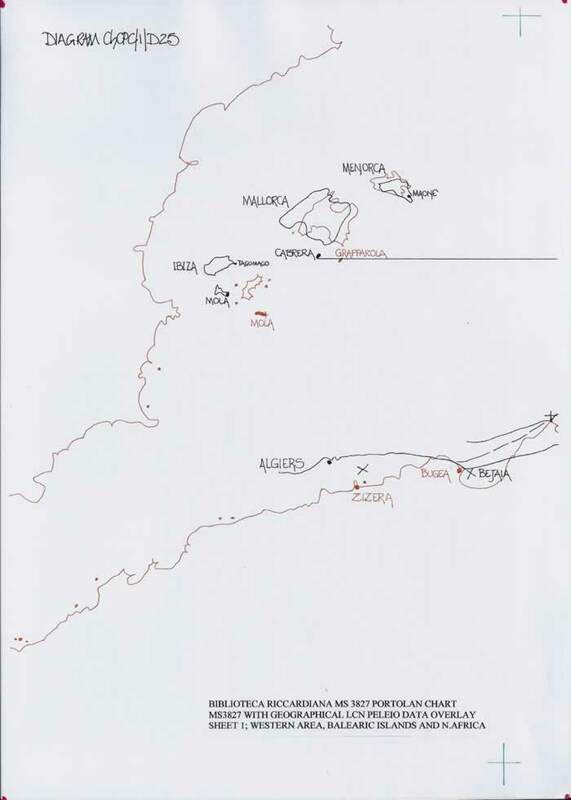 From Aigues Morte to Fornelli Menorca, LCN notes, CCLXXV or 275 millara with a wind direction of Meczo. It is actually CCCX or 310 millara and Meczo but the spectre of scribal error immediately arises. The Roman CCCXXV not CCLXXV would be quite acceptable as it is only a 15 millara change from the geographic distance. Unfortunately there is not a direct continuation due south and thus we must look for a near alternative. 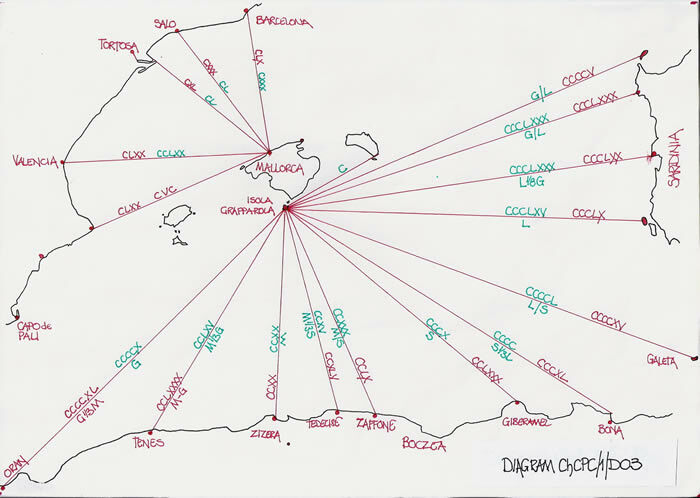 Maone, Menorca to Zaffone is given as CCC millara (actually CCLXX) with LCN direction given as Meczodi. It is actually M/S poco, that is very slightly east of south but would be an acceptable bearing for the research. Thus the only failing in this North/South alignment is the short Fornelli to Maone via Silocco distance of 20Km/16Millara across the island. 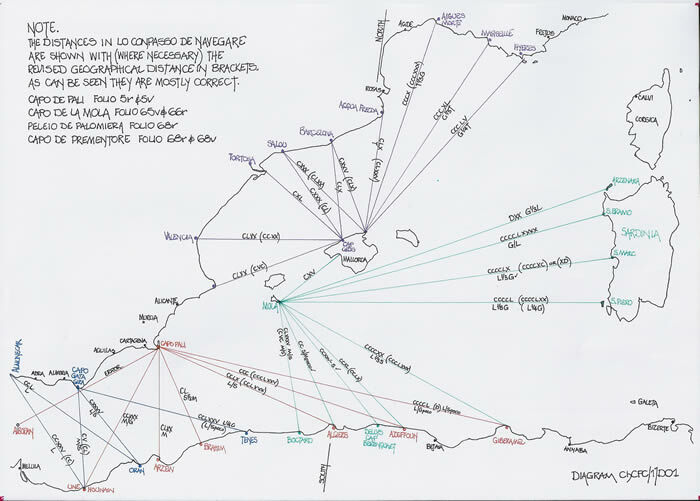 It is therefore quite possible to opine that the setting out of the map could have been from this North/South line via Menorca as the diagram illustrates. 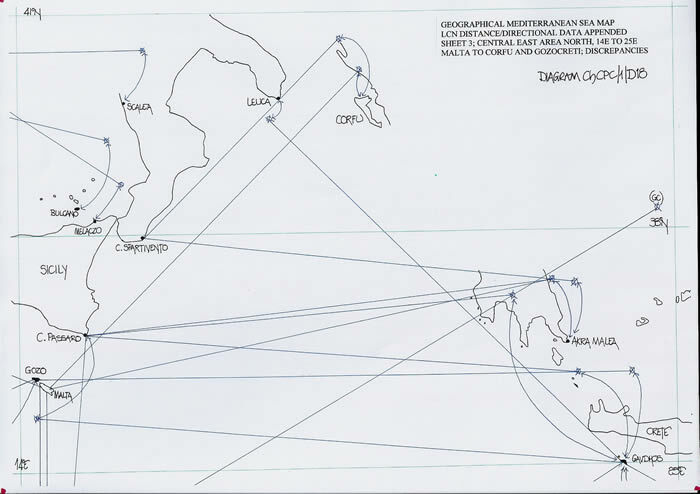 The LCN distances and the geographical distances are very similar and there are 16 Peleio directions from NE to SW starting at Maone as diagram ChCPC/1/D02 illustrates. However that is not enough to progress to a map of the whole Mediterranean Sea basin. I have already opined that to draw a map of the western Mediterranean Sea area the ideal starting point would be a North/South alignment the 9E longitude gives. Why? Unfortunately there is an error of distance measure in the last noted. If we study the Itinerarium Maritinum part of the Itinerarium Antonini Augusti there is no excuse for this error, which, as I will show later in this text has great ramifications for the whole chart. The It. Mar. has; a Caralis Galatam usque insulam stadia DCCCCXC (990) which translates to a precise 183Km and 149 millara, the geographical distance. We then read; a galata Tabracam in Africam stadia CCC (300) with the translation to 55.5Km and a geographical 58.5Km. There is a confirming route which is; a Caralis traiectus in Africam Cartaginem stadia MD (1500) being 277Km and actually 291Km; acceptable accuracy! 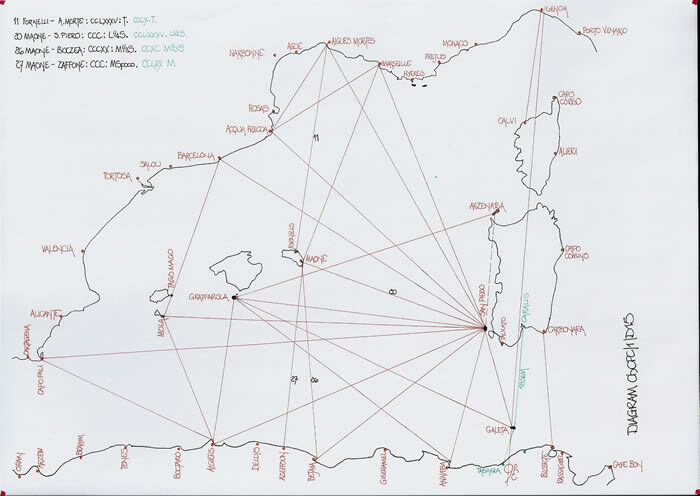 But for our purposes the alignment using the 9E longitude has many advantages in that it provides for Peleio routes both east and west and through the important Sicilian Channel to link to the Eastern Mediterranean Sea area. I therefore decided on balance that this alignment was the most likely to have been used to construct the map from the Peleio distance/directions given in LCN, or should I correctly state, the more accurate predecessor I consider existed.. To commence I looked again at Peleio with the 8 major wind directions and particularly those E/W and N/S emanating from the Islands. 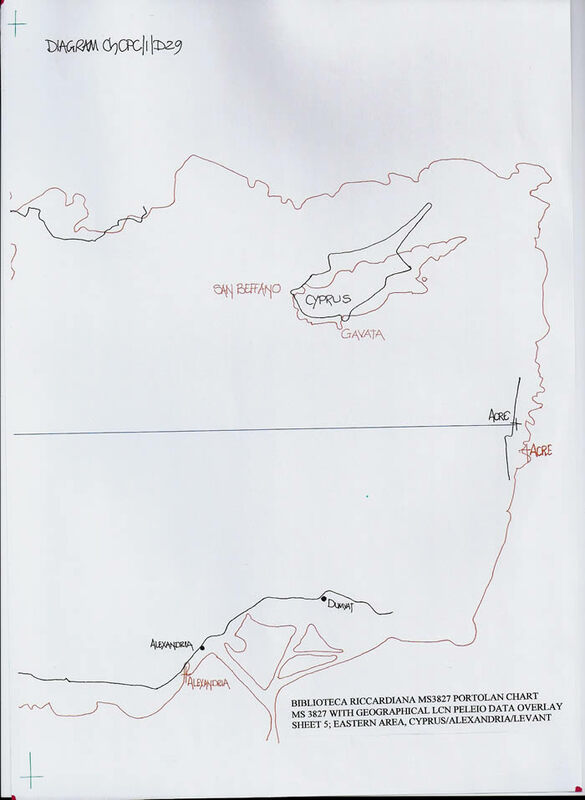 Study the Peleio routes which commence in LCN at Folio 63r with “Peleio de Capo de Pali” and it becomes very apparent that certain headlands/capes and islands are favoured. There is a basic system dependent upon the geographic start position for the Peleio; they radiate in a progressive arc from each start point. Thus when all are plotted it is rather like a fan vault in a cathedral, lines intersecting and culminating in many similar positions or coastal features. Thus a natural triangle is formed by these interlocking lines. View diagrams ChCPC/1/D01 to D04 as overlays and the picture is so very clear. 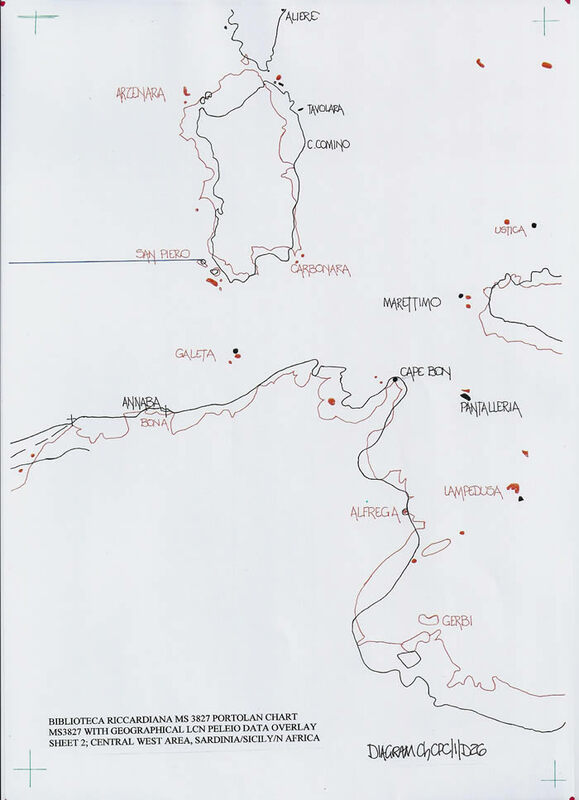 One of the obviously favoured islands for Peleio distances is San Piero, SW Sardinia; it has a direct east/west alignment to another favoured island, Grapparola, south of Majorca. But in reverse we read; De la dicta isola de Sancto Piero a la Grapparola CCCLX millara per garbino ver lo ponente paoco. This is so obviously an error which we can reconcile by reading the next item; de la dicta isola de sam piero a Bozea CCCXX millara per garbino. That is accurate for both distance and direction and an important route. Return to the Sancto Piero/Grapparola route, remove the ‘garbino’ and you have ‘ponente’. It is a scribal error by a line of misread and thus mis-copied text. Thus I make this very important statement; do not read LCN and accept any distance/direction data without a geographical check on both. The scribal copying is rubbish. Do not worry about a magnetic deviation as within the text of LCN there is no such thing. Thus from the Grapparola/San Piero alignment there are several triangular formations which can be assessed. The first chosen is Grapparola/San Piero/Arzenara, but you will not find a Peleio route from San Piero to Arzenara. It is more subtle than that to find the triangle. De la dicta Grapparola all’isola de l’Arzenara CCCCV millara entre Greco e Levante, e poco plui ver lo Greco. That is an intriguing directional statement; sail Greco/Levante, (i.e. N67 ½ E or NE22 ½ E) but actually sail a little towards Greco or North East from the base ENE given. Measure the angle from Grapparola to Arzenara, it is N64E or NE19E, that being a 3 ½ degree shift in the sailing direction. In my previous text ChLCN/1, I noted the smallest direction change actually named was “octavo”, which is c5 ½ degrees. Now I can indicate that the medieval mariner could actually discern smaller changes in direction of up to 3 ½ degrees. I had already opined in my ChUG/1, “Using a Portolan Chart at sea, Did they?” that a high degree of accuracy was possible, this text is a small confirmation of that posit. 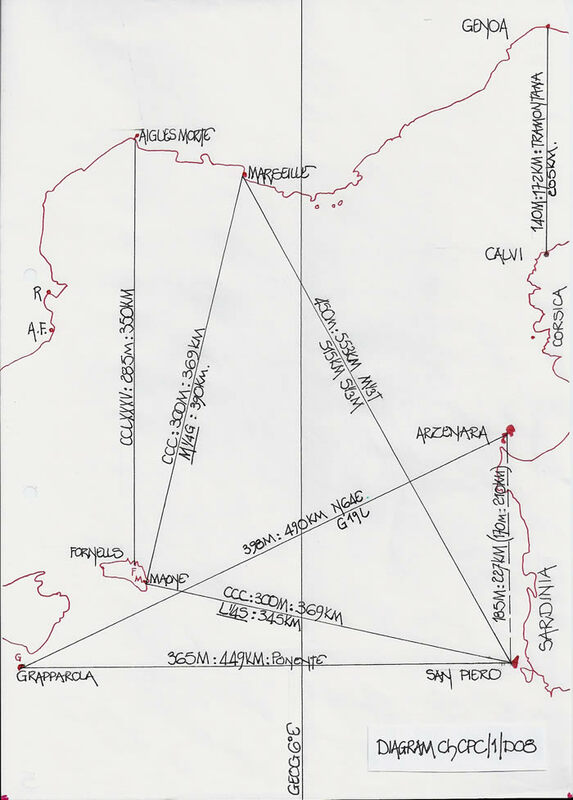 But this triangle is not completed by Peleio routes; it requires two Peleio and a “Starea” addition for the coastline of Sardinia from San Piero to Arzenara. Why is this important? Simply, because Arzenara is due north from San Piero and the “Starea” distances are as follows; 50+10+20+15+30+20+40 = 185 millara. From Grapparola to Arzenara is 405 millara and from Grapparola to San Piero is 360 millara, Peleio distances from LCN. A simple mathematical check using “Pythagoras” gives (405×405) – (360×360) = 34425 of which the square root is 185.5 millara. Here in the centre of the western Mediterranean Sea is a perfect maths triangle, not only good distance measures but excellent directional notation. But if we look at the precise geographical distances the circumstances of this triangle take on a greater significance. Geographically, Grapparola/San Piero is 450Km or 366 millara, and Grapparola/Arzenara is 490Km or 398 millara. But San Piero to Arzenara is geographically 215Km or 175 millara. Thus the accuracy is an astounding 10 millara or 12.3Km discrepancy within the triangle, and I was thus convinced I could commence here. Thus we read of two identical distances, 300m/369km and the wind directions set precisely at 90 degrees; they are W11NW and S11SW. The calculations are (300×300) x 2 = 180000, whose square root is 424.26 millara and thus a discrepancy of 26 millara or 32Km. To be entirely accurate and precise in the research I now give the geographical figures for the right angle triangle described. SP to Maone, 345Km; Maone to Marsellia,390Km; Marsellia to SP, 515Km. The 515km is 420 millara and thus the 424 calculated is accurate. Prove it! (345×345) + (390×390) = 271125 whose square root is 521Km the equivalent of 424 millara as the LCN measures calculated: Medieval mathematics are at times so very good. SP/M 450m/553Km; M 1/3 T – correct. M/AF( LCN) CLXXXV (CLXXX) 221km. G/m poco correct. Geog = 225Km. 2) San Piero/Aigues Morte/Acqua Frecda. This triangle is interesting; the fact that SP/Grapparola is East/West and Grapparola/Algiers is CCXL millara stated as Meczo di ver lo Silocco quarta, but actually geographically S5E or M ver lo Silocco poco. This is practically a right angled triangle with LCN distances of 360/240/400 millara or 443/295/492Km. Geographically they are 360/215/420 millara or 445/265/515Km, and thus acceptable as another locator triangle. My first remark is that there are simple scribal errors, look at the Roman numerals! But it also indicates that the figures were accurate at one period in the life of LCN. 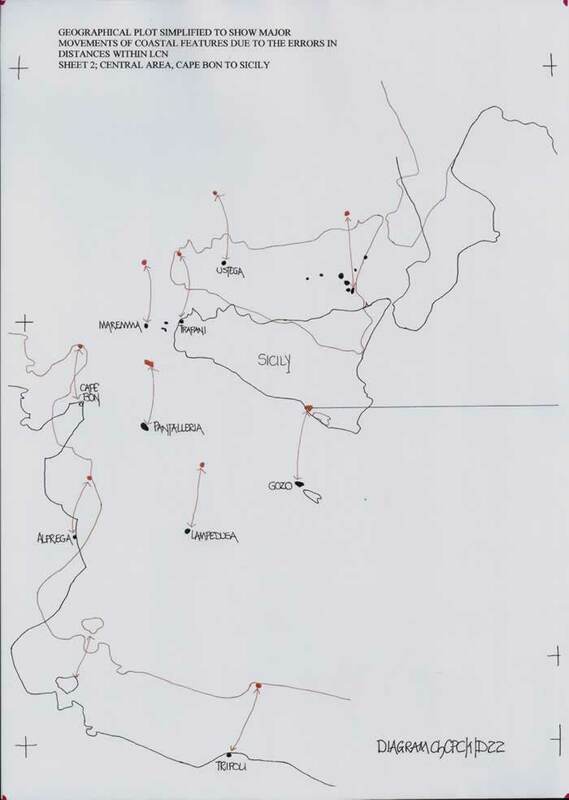 What is also evident is that from these scribal errors the North African coastline has moved northwards when set out from Sardinia by between 50 and 80Km and thus the positioning of the 37N latitude, which should fairly represent this section of coastline will deviate northwards and thus be interpreted by Historians and other researchers who have not drawn the data, as a magnetic deviation. My diagram indicates the deviation as detailed in the above errors to be found in LCN. It is of course not a magnetic deviation, it is purely a scribal error as the table and Roman Data indicates. 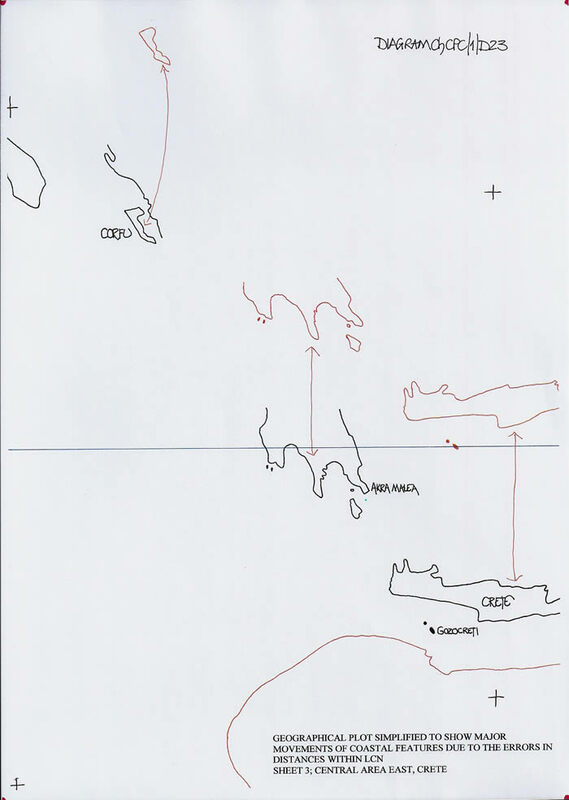 This is a common type of error in LCN copying and in this instance when these figures are used they impart serious consequences for the positioning of the Islands around this portion and of Sicily and follows through to the Eastern Mediterranean Sea area. As a digression here, but very pertinent is my text and the chart of F Beccari, dated 1403. The following extract from my text sets the problem of the short distances from Sardinia to North Africa into the medieval cartographer’s realm. To (ChFB/1/D11) to (ChFB/1/D13) as Diagrams ChCPC/1/D12 to D14. “Francischus Becharius civis Janue, compusit cartam presentem in civitates Saone (anno) millessimo CCCC tercio, de mense februarii. Qui Francischus notum facit ad tollendam cunctis materiam dubitandi, et omnibus navigantibus et navigaturis mare oceanum protestatur, quod ipse Francischus, in hac et ceteris cartis per eum compositis ab anno Domini MCCC decursso citra, prolong avit distanciam itineris steriarum maris oceani spatio miliarum seu leucarum plusquam ipsemet Franciscus et ceteri magistro cartarum, tam Catalani, Veneti, Januenses quam alii qui cartas navigandi fecerunt temporibus retroactis, soliti errant in eis apponere; et potissime in costa Portugalli, videlicet ad capud Sancti Vincentis (sic) usque a capite Finisterre, et in steria maris seu litorum et locorum Byschaye et costa britanie atque insula Anglie, comperta veritatis essercia de predictis per experienciam efficacem et relationem certissimam multorum numero magistrorum, patronorum, naucleriorum et pilotorum maris Yspanie et illarum parcium, et aliorum eciam peritorum in maris exercitio plurimorum, qui frequenter et longo tempore per illas partes et maris navigarent. Et pro tanto, nullus miretur si de manu ipsius Francischi duarum formarum cartas super hoc dissimiles reperiret, qum ipse ante MCCCC primum aliarum cartae mensuras et magistrorum antiquorum formas et uestigia sequebatur et male. “Francesco Beccari, citizen of Genoa, has written this present paper in the town of Savona, in the month of February 1403. With this written text Francesco wants to dispel any doubts. The ocean and everybody who has sailed the sea are called to be witnesses, that with this paper and the others that he prepared in year 1400, and not before that, Francesco made the route longer in miles or leagues compared to what had been done until that time by Francesco himself and other cartographers, no matter which identity: Catalan, Venetian, and from Genoa and the other cartographers from the past and who were used to opposing to what he (Francesco) said; in more detail such an extension was for the Portuguese coast which means from the Cape of St. Vincent as far as the Cape of Finisterre, for the sea route or the coast of the Bay of Biscay and for the coast of Brittany and for the English Isle. The discovery of the real situation that is stated above was due to the endless experience, a better and more aware skill in the narrating and writing of the very many master craftsmen, friend-patrons, ship-owners, ship-captains in the Spanish sea and the other water bodies and many others who are experts in the knowledge of the sea and have been in those places and surfed the seas/oceans for a very long time and frequently. We do not need to be surprised to find maps (of the same areas) which are different even to ones prepared by Francesco and concerning the territories mentioned above ( the maps show different shapes) depending on the year they were mapped out before year 1400 when maps were drawn according to what the tradition of the old masters had been, even the mistakes. Furthermore, thanks to the contributions of many ship owners, very skilled ship captains and sailors, I, Francesco, was told in various circumstances that the Isle of Sardinia, the one which is located at sea, had not been placed in its right position by the masters, therefore in the name of Christ, on this present map I have placed the mentioned Isle of Sardinia where it actually is. Therefore you, the owner of this map, are well informed as is everybody else present here”. 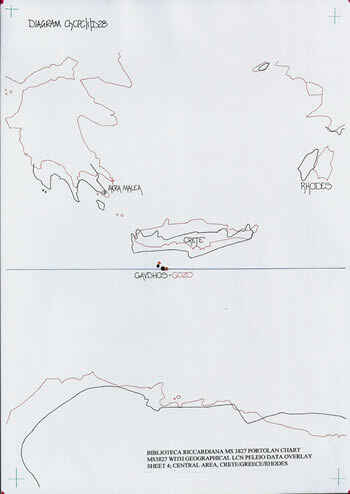 Francesco Beccari has clearly stated that he has altered certain distance measures upon his chart (1403) and “placed the island of Sardinia in the present chart in its proper place, where it actually is”. If Diagrams (ChFb/1/D11) ChCPC/1/D12 and (ChFb/1/D12) ChCPC/1/D13 are studied the variation in the chart to geographical position has been shown with minor differences not quantified on Diagram (ChFb/1/D11) ChCPC/1/D12. However, on Diagram (ChFb/1/D12) ChCPC/1/D13, the distances are quantified as they reflect the major points made in F.Beccari’s text. The coastline of Portugal is still one half degree short with the error occurring north of Lisbon to Cape Mondego and is reflected in the final positioning of Cape Finisterre, a half degree south of actuality. 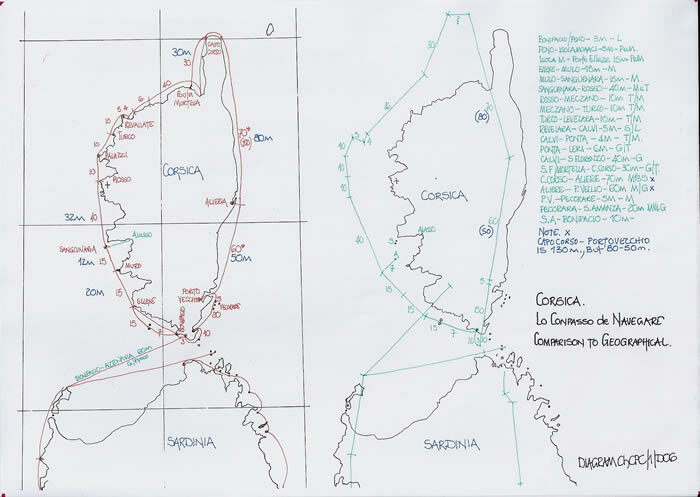 Sardinia has been positioned from Genoa for this exercise and in fact was quite accurately drawn in its latitude, but the overall Genoa to Bizerte distance is 80Km too long. End of insert from ChFB/1. As an addition to my text concerning F Beccari, I include also diagram (ChFB/1/D13) as ChCPC/1/D14, it has an illustrative text of the errors within the F Beccari text. I then include diagram ChCPC/1/D15 as an overall summation of the triangle plot discussed. From the LCN text which indicates the distance shortened by 80Km we moved on 100 years to the F Beccari text where as I have just indicated the same distance is increased by 80 Km in order to correct an error but actually just to reverse it and maintain an error. The methodology I have indicated in the foregoing text is carried through to the area east of the 9E longitude and thence across the eastern Mediterranean Sea area to the Levant shore. At each stage there are highly accurate distance/direction Peleio units until the Gozomalta to Gozocreti and Gozocreti to Acre Peleio are evaluated, which are an enigma. However it should be quite obvious by now that the idea of Magnetic readings producing the LCN text and thus the distortion of the chart have been nullified by the data illustrated here-in. The proof of that statement is now given. Having shown that south of Sardinia the distance measures are awry in LCN it is a simple task to assess the impact of them upon the East. I have drawn the distance directions as stated in LCN from both Sardinia and Corsica to illustrate the profound distortion caused thereby. 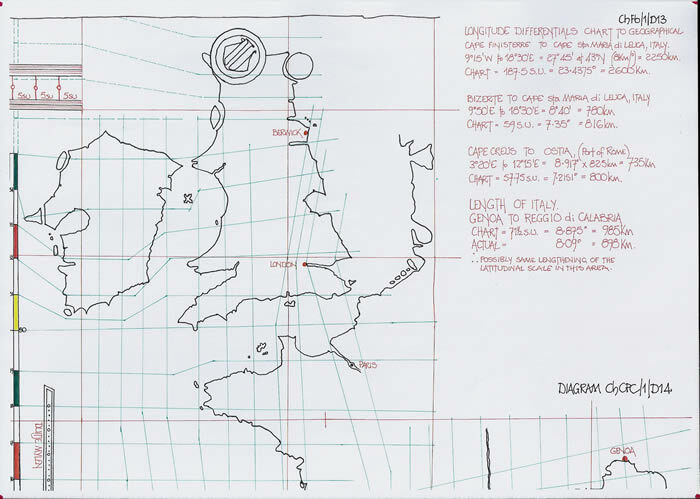 But it is not the Tyrrhenian Sea distance direction data that is important in the discovery process for the overall chart construction, even though through its usage the Italian coastline moves north and east, it is the passage through the Sicilian Channel via the Italian Isles to Gozomalta and Malta that must be properly examined as this is the link from west to east, the only Peleio link available. Draw the LCN data from 9E to 15E and thence to 24E, to Gozocreti and the whole geography changes. 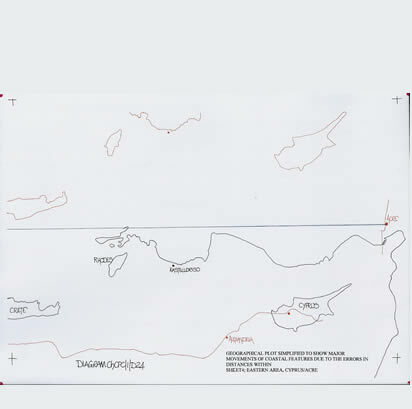 Firstly by re-aligning the map plot to complement the revised (erroneous) positions of the Tunisian coastline the links to Gozomalta move northwards. But it is an erroneous alignment born of scribal miscopying from extant data. Rome sailed from Tunisia via Sardinia for centuries and as I have shown the distances quoted in LCN up to 80 Km adrift would not have been acceptable. This was an important route, Corn to Rome for free issue. However, the illustration of the problems does not finish with the above text as immediately Gozomalta to Gozocreti as described in LCN cannot be east/west. The errors make it appear so and also no doubt have encouraged historians to consider the magnetic reading for deviation. It is not so, there is no magnetic deviation within the LCN text. Thus I move to the Gozocreti position dictated by the erroneous LCN figures and indicate how the scribes have caused a momentous problem for the cartography of the Portolan Charts in the 1300’s. 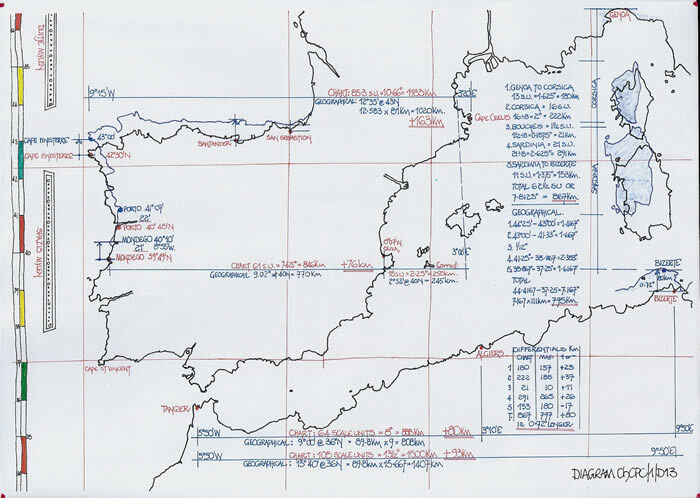 Drawing the Peleio data provided by LCN, I can locate the various major coastal features which are important to the overall layout of the “Map within the Portolan”. However, yet again the spectre of mis-copying must be addressed. Simply put, Gozocreti to Acre is c1050Km, some 850 millara and directionally E16S. Folio 94v states; De lo dicto Gozo enn’Acri DCCCXX millara per levante, 820 millara/1009Km. That is a minor 40km problem but it affects the map plot via the changed direction. Following, we have “Gozocreti en Alexandria CCCCXC millara per Silocco ver levante terza”. 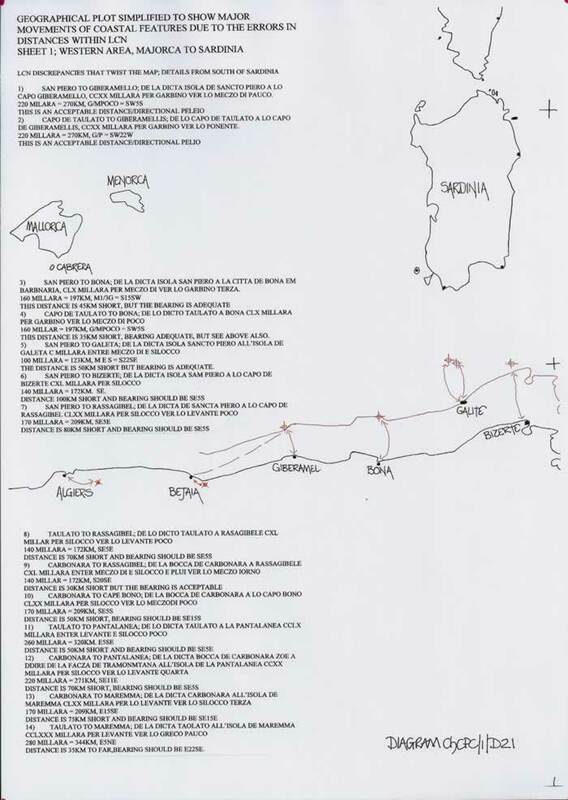 (490m = 603Km) When the whole area is set down according to LCN there is a correspondence to the data and the geographical fact, but Gozocreti to San Beffano, Cyprus, given as DCC millara should read DCX, that is, not 861Km but 750Km, a scribal error. Had the North African coast and Italian isles been properly noted by their actual distance instead of the scribal error persisting then the position of Gozomalta and Gozocreti would have been somewhat closer to the geographical and Acre correctly sited. Hence there would have been no distortion in the 1300’s charts such that it could have encouraged persons who did not draw the information as a chart to consider a magnetic compass deviation. It is scribal ineptitude with the copying of the data that was available that accounts for the mis-shaped Mediterranean Sea profile. 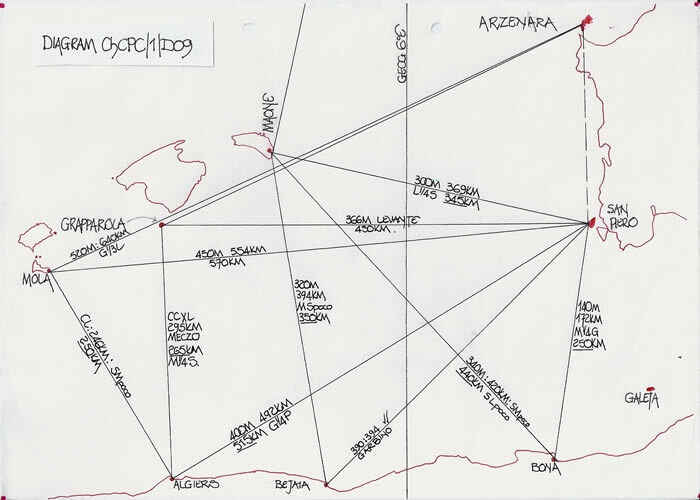 I have carried out a preliminary assessment of the MS 3827 chart and can illustrate its general adherence to the LCN Peleio distance/direction data on the appended diagram examples. 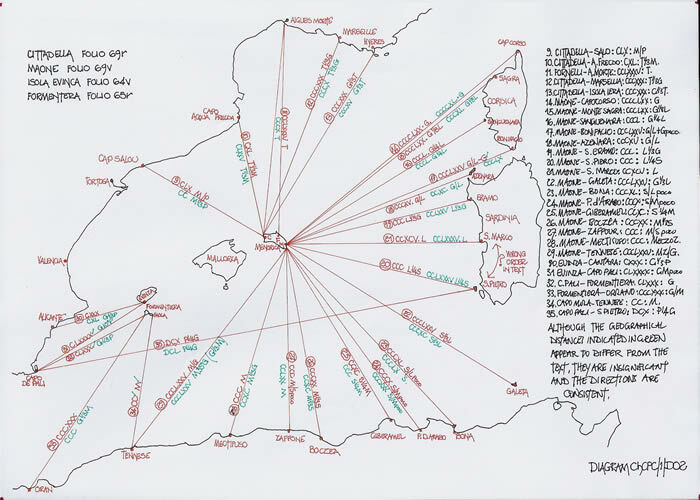 I have listed 59 coastal points on the schedule (appendix 1) included but not all are drawn as a linear example due to the overcrowding of the diagrams. What I present is a general example to be expanded in a following text (ChMAT/1), but the overall comparison indicates a general adherence to the LCN text and its vagaries. It confirms the twisted shape of the map from scribal errors and proves incontrovertibly that there is no magnetic deviation within the Portolan Chart. But, it also provides good evidence of a more accurate and older LCN text as the MS 3827 chart covers the whole of the Atlantic seaboard of Iberia and France/Europe. I now conclude my short text, but, part of the following conclusion requires extra information to explain the historical reasons I state, and perhaps how the data in LCN was gathered and produced. I conclude therefore with a very basic historical timeline for the geographic data available and thus the possible origination of the LCN in Appendix 2. This is a suggested scenario for the origination of the LCN data. At sometime during the Roman period their systematic collation of data produced an overall text which allowed the “Itinerarium Antonini Augusti” to be produced. What we have is a partial copy, which has been much copied and suffers the same scribal errors as LCN. The Tabula Peutingeriana indicates that much more knowledge was available for usage to the mapmakers. Then Rome gave way to Germanic tribes but in the background by then and growing stronger each year was the “Church” in all its final guises. That “Church” saved a myriad of texts, many of which we study today because of their actions. Rome had maps, good maps and excellent surveyors, had sailed and ruled Mare Nostrum for some c600 years, and recorded the distances precisely. Thus we have a basis to explain the data which we read in LCN. It is also certain the Roman State had a base map of the Mediterranean Sea basin, even if it was drawn in sections, and it would have been readily available. Did it survive until the 11th or 12th centuries, is a question still to be answered, but what appears to have survived is the written text of distances around the coastline, both by land and by sea. 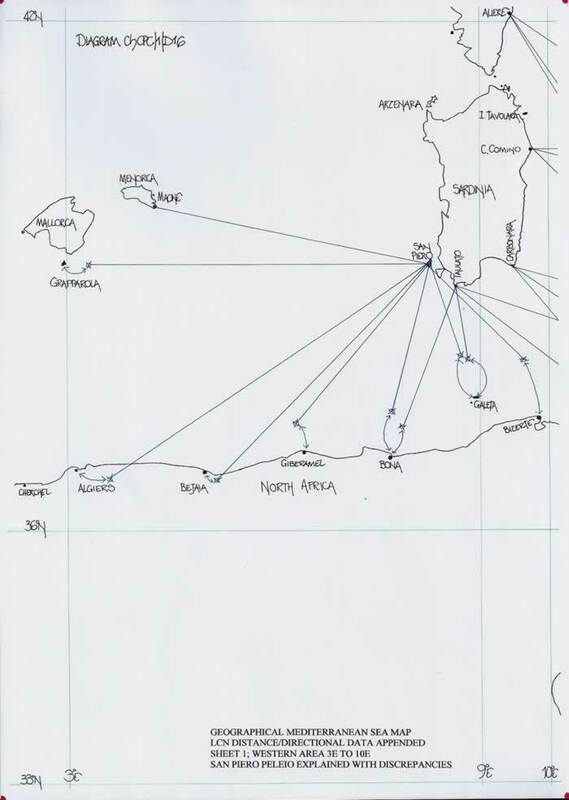 Thus we have the forerunner of LCN, which has been copied and copied, translated and re-dimensioned from the 8 stadia to millara at a ratio of 6:5, confirmed by a Portolan chart. The errors in LCN are tantamount to negating the “Starea” section, it is unfit for purpose, but the Peleio section for the Northwest Mediterranean sea area is excellently recorded. This was the heartland of Roman Sailing and thus measurement. Then as it records the Eastern section it becomes progressively inaccurate through obvious scribal errors. How many times was it copied and by whom? Considering we know that texts were traded between monasteries, copied time and again, should we be surprised at the multitude of errors within LCN or should we be perhaps be considering that the number of errors is an indication of its age through multiple copying. An age far exceeded by the 1296 date. But, when it comes to drawing a map from the data in LCN of course those errors compound to produce distortions which have been misread by Historians and thus the idea of magnetic compass bearings was thought up to hide the fact that not one researcher drew the actual LCN data as a map to find the true reason for the distortions. I have clearly shown that it is purely scribal errors which have distorted the map and therefore had the distances south of Sardinia been correct the ensuing map particularly in the eastern section from Gozocreti would have been geographical and thence the Gozocreti to Acre alignment corrected also. 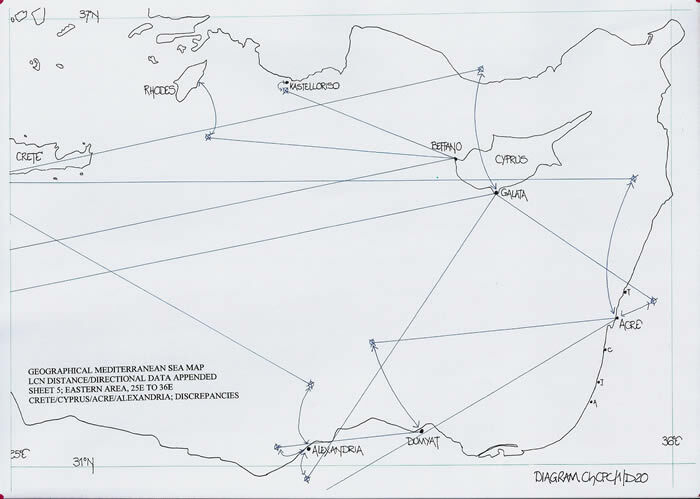 Thus the Peleio distance/directions in LCN can be used with caution to construct a map of the Mediterranean Sea basin taking cognizance of the obvious errors. But now the LCN text could be rewritten to provide a very acceptable basis on which to draw a map of that whole Mediterranean Sea basin. It would still be medieval data and the ensuing map would actually indicate the medieval world view of the Mediterranean Sea basin. Yes, there would be errors and distortions in such a map but at least we would understand it all. 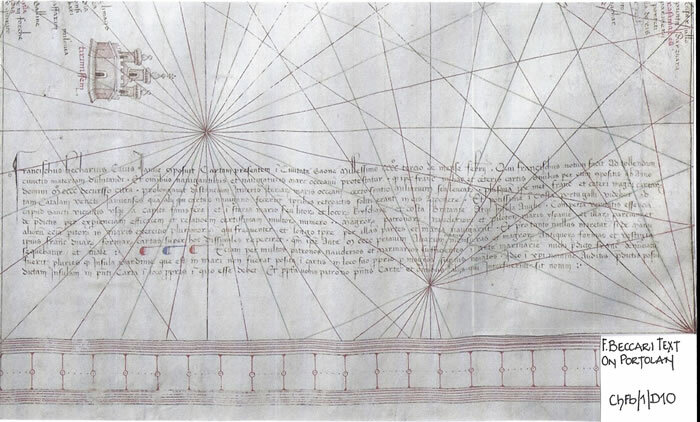 It is not feasible to assess Portolan Charts without recourse to a draughtsmanship methodology being utilised. Thus by drawing the map you will understand the underlying mathematics and geometry with which they are constructed. From the Windrose being a pure geometric construction and the basis of the Portolan Chart, to the same triangular measures which are the basis of the “Tavola De Marteloio”, the scale of the chart follows through which is a mathematical decision of the original cartographer. It is all draughtsmanship and geometry, no history and no magnetic deviation. Draw the map or chart before writing its history! As I have clearly shown there is no magnetic influence upon the charts and in fact as they are drawn from corrupt data, then it follows it is a corrupt chart. If the data were corrected it would become excellent. But, being corrupt it is totally inappropriate then to use the Cartometric techniques to analyse them. What are you analysing? A corrupt chart!! Until a chart can be shown to have any magnetic data there-on, I suggest the charts are subjected to LCN scrutiny for distance/direction. It appears probable none exists at all. 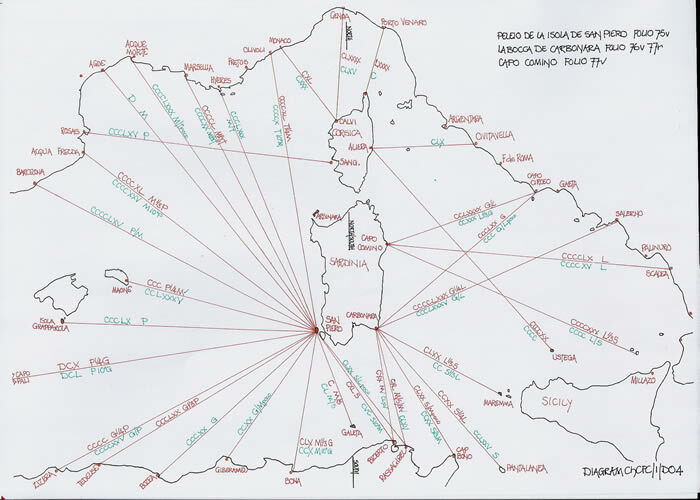 The earliest example of a Portolan chart, be it Carte Pisane or Riccardiana ms3827 can be shown quite conclusively to be drawn from the data in the Peleio section of LCN. Thus it is not the Portolan Chart which must be investigated but the LCN data, as I have already opined, to determine the original distance/directional data and why it is so accurate in many parts. I have yet to be convinced there is a logical evolution of these charts, but rather consider that from a simple knowledge of draughtsmanship there are several branches of development which are not necessarily co-joined, but the Peleio LCN data, or should I say the original data from which the LCN has been copied is the basis for all charts. ChCPC/1/APPENDIX 1. Distance comparisons, LCN Millara. 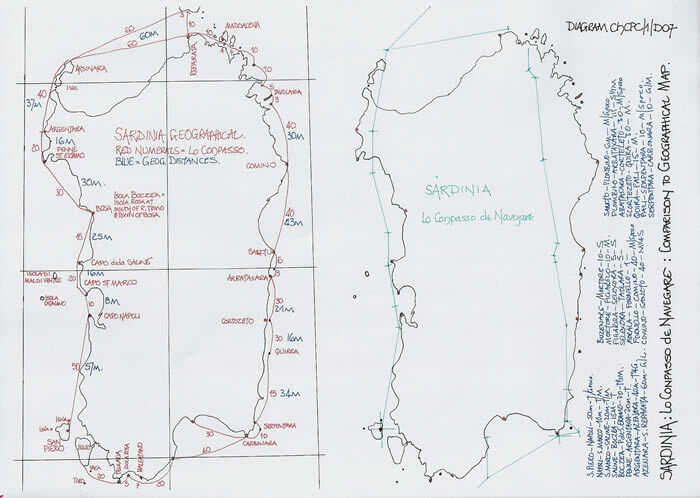 Ricci/Geog/Carte Pisane. The historical basis for my suggested scenario to produce the Portolan map. This is not a thesis, but merely a series of historical facts and information which I believe may have led to the origination of a “Portolani Text” by Roman scholars. 1)450BCE; Herodotus writes of a map displayed by Aristogorus to the Spartans to encourage their participation in a war against the Persians. He states the map shows the land form and rivers etc from the Aegean Sea to the Persian Gulf, Sardis to Susa, and uses the Royal Road distances to confirm its accuracy. 2)250BCE; Eratosthenes writes “Geographia” (which Strabo used to produce his text)which includes distance measures for the Mediterranean sea and Middle East across to central Asia. 3)50BCE; Julius Caesar instructs that a world survey should take place to determine other lands available to Rome. 4)12BCE; Marcus Vipsania Agrippa completes the survey and produces a world map which is displayed in Rome. 5)40CE; Pomponius Mela (among others) writes his description of the world. 7)70CE; Pliny the Elder writes his “Natural History” which includes geographical data and discusses distance measures as well as latitudes. Slightly earlier, Vitruvius in his 10 books writes about the Analemma which converts the Gnomon readings to daylight hours for a clock and of course also produces the latitudinal position of the Gnomon. 8)100CE; Marinus the Tyrian produces his text and maps. 9)150CE; Claudius Ptolemy uses the above data and produces. 10)4thCE; Tabula Peutingeriana is produced using the Roman itinerary measures, far more than exist in the Itinerarium Antonini Augusti, which also includes the Itinerarium Maritinum. 11)5thCE; Paulus Orosius, Cleric, commences his text with a Geographic treatise on the known world. Why? Then manner church scholars follow suit. 12)9thCE; Dicuil writes “De Mensura Orbis Terrae” and updated and edited a map and text derived from M V Agrippa. The map itself was extant whilst Dicuil was writing. Thus the “church” and “monastic” system probably held data of at least 8 centuries and used it in geographical treatises and to produce maps. My text StM/1 illustrates that fact. In 1140/1150, King Roger II of Sicily who was an avid collector of geographical data thus enabled Al-Idrisi to write his treatise and produce the accompanying maps. This work was carried out in a Benedictine Monastery with translators available for the three major languages of the era. And I have not forgotten the Arab input, but a text such as “The Book of Curiosities” which is a form of periplus, short on real distances etc, includes measurements of the earth, the dimension of a degree of latitude and in discussing the work of Claudius Ptolemy is an indication of the genre. Thus I present some simple logic, but no proof; circumstantial evidence perhaps, but I believe firmly that long before the 1296 date of LCN there was an excellent Peleio document. M J Ferrar November 2015.